Pendragon of Mars was a seven session campaign run by Monsters and Manuals all the way back in 2013 (I know it wasn't that long ago but I wouldn't know what an RPG was if you concussed me with one in 2013). For some reason, I found the concept (feudal mech-knights on Mars) weirdly enthralling, despite its silliness. So I planned to start running it (with a combination of a boiled-down Pendragon and ICRPG fan-made mech hack), before realizing I had no monsters. I don't know how useful this post will be (with stats given for Pendragon instead of any conventional OSR systems) but it'll become more helpful if/when I release a polished-up Pendragon of Mars hack. 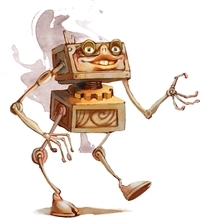 Geteit Chemosit are cylindrical, 4-legged automata wandering the deserts of Mars, attacking people and stealing their brains to bring back to their masters. There are two types: the oldest Geiteit Chemosit were made of a durable green ceramic before the apocalypse, while the more recent are made of red stone by the Martians. All Geteit Chemosit are controlled by the brains they steal from the people they attack. Some scouts have sent reports of Heitet Chemosit: they tower over even the largest Geteit. Decapitate: If a character is Unconscious next to the Geteit Chemosit, it can spend its action sawing through the character's head and removing its brain, instantly killing the character. Modrons were a pre-apocalypse plan for terraforming Mars. Since the apocalypse, they've spent their time excavating and building in random places. They all come from the northern Modron's Wilderness: a landscape edited into a forest of perfectly geometric stones and tall pillars. Sadly they do not come as cakes. The deserts of Mars are patrolled by giant sandworms with mouths the size of houses. Making loud noises does not attract sandworms: in fact, it intimidates them and forces them away. The Pale are whip-thin and up to 10 feet tall; their heads are hollow toruses, with a reflective black dot floating in the center. They have no eyes or mouths. According to folklore, the Pale are the ghosts of the dead ancients: the Crowned Ones who colonized Mars and built the mechs that are still passed down. The Pale support these rumors; it makes people leave them alone. Martians are mole-like bipeds with a stark red coat. They are nearly blind, seeing with a tendril-covered nose. They live below the surface of Mars, where their mine-cities stretch for hundreds of miles. The Martian nations are careful to keep relations between each other jovial: a care they stretch to the human kings as well. Xosna are small, weak things with a single, 3-pupilled eye. They are on a crusade to bring their religion (and the advancements of their society) to the rest of the world. To the human kingdoms, they are a plague that constantly pushes its borders. The Xosna are organized into a caste system of queens, workers, and praetors, who are the vast majority in the Xosna crusade. Praetors are sealed into their mechs for life. If there are other Xosna nations, they have not been heard from. Perhaps they support this crusade as well. Silver Swords Has 48 Hours Left!